Deep within each of us lives a primal memory of a time when the natural world was recognized as divine and our temples were built from sacred materials enlivened through magic. Temples were not places you visited once a week; they were centres of community, divine work, healing, and wisdom, places where Heaven and Earth meet. This union of Heaven and Earth--the sacred temple--is also a union of Thoth and Isis: the Egyptian god of wisdom and the creative cosmic force and the Egyptian goddess of civilizing knowledge. Their relationship established the celestial teachings on Earth, for Thoth taught Isis all the mysteries and magic she knows and Isis acted as Thoth's instrument to deliver the teachings in a form humanity could use. In this initiatic guide to temple building on the spiritual and physical planes, Normandi Ellis and Nicki Scully explain how to create a communal spiritual structure for connecting with the ancient Egyptian pantheon as well as how to consecrate yourself and become a vessel suitable for divine wisdom and a home for your personal gods. The authors detail the construction, shamanic visioning, and ritual consecration of a Moon Temple dedicated to Thoth. They explore teachings that help you develop relationships with the Egyptian neteru and realize your place within the family of the Egyptian pantheon. They guide you as you create your inner heart temple, the adytum, a safe place in which to receive guidance and access your higher spiritual bodies and oracular gifts. They provide shamanic journeys and initiations on ascension, shamanic death and renewal, soul retrieval and healing, multidimensional realities, and more. By creating a sacred temple within and without, we each can take part in the union of Isis and Thoth and restore the magic of the Egyptian mysteries to our time. Normandi Ellis is an award-winning writer, workshop facilitator, clairvoyant, and spiritualist minister. She is the author of 11 books, including Awakening Osiris, Invoking the Scribes of Ancient Egypt, and Imagining the World into Existence. Nicki Scully has been a healer and teacher of shamanism and the Egyptian mysteries since 1983. 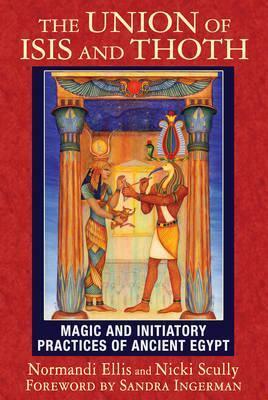 Her many books include Alchemical Healing, Shamanic Mysteries of Egypt, and The Anubis Oracle. Founder of Shamanic Journeys, Ltd., which specializes in spiritual tours to sacred sites in Egypt, she teaches at conferences and festivals throughout the world. Nicki lives with her husband, Mark Hallert, in Eugene, Oregon, where she offers retreats, private sessions, and teleseminars.